At UN on Libya, Churkin of Russia Tells Western Spokesman Not to Spin the Press, "This Is Where Distortions Come From"
UNITED NATIONS, March 21 -- Outside the UN Security Council on Monday afternoon, a Western Council member's spokesman was telling reporters that as he had predicted, the Council had declined requests for any meeting about the military action in Libya until Thursday. After Churkin went upstairs, there was speculation about what had triggered the confrontation. 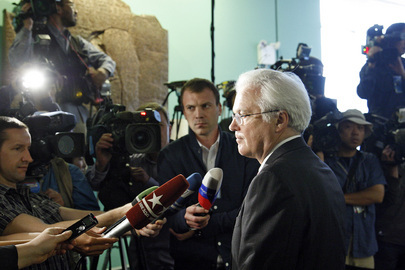 On March 16, Churkin had complained about being portrayed as an obstructionist. Inner City Press later on March 16 asked US Ambassador Susan Rice about what Churkin had said about Russia's ceasefire in Libya proposal. She said the proposal did not go far enough. Inner City Press suggested to him that the Russian Mission's spokesman should brief the media more often. While that seems to be the consensus among most of the stakeout press corps, others note that some delegation's spokespeople are more likely that others to tell reporters about other countries' positions, while demanding off the record treatment. This happened during the first Council resolution on Libya earlier this year, when Portugal was accused off the record of being “weak” on the referral of the case of Libya to the International Criminal Court. Later, reporters were urged to “ask Brazil” if they were making problems with the ICC referral. In fact they were, though not at the spinner had implied. Rather, Brazil objected to the US demanded carve out from the ICC referral for countries that are not members of the ICC: not only the US, but such countries as Algeria and Ethiopia, which are not members of the ICC. “Now we know where all the distortions come from”? Oh that it were so. Watch this site. UNITED NATIONS, March 20 -- When UN Secretary General Ban Ki-moon settled on Abdel-Elah Al-Khatib as his envoy to Libya, questions were raised by Inner City Press about Khatib's business dealings including as a director of Jordan Ahli Bank, which is a co top 20 owner of Union des Banques Arabes et Francaise along with the Libyan Foreign Bank, a 100% owned subsidiary of Gaddafi's Central Bank of Libya. The UN has yet to address these conflict of interest, instead telling Inner City Press that Khatib will file a financial disclosure at some later date. But now another problem that the UN should have foreseen and acted on has arisen. Inner City Press is told that Khatib still receives a salary from Jordan as a Senator. A person cannot work for the UN and receive money from a government at the same time. But Khatib insists he can, and Ban is in too deep, the sources say, to even try to enforce the UN rules. 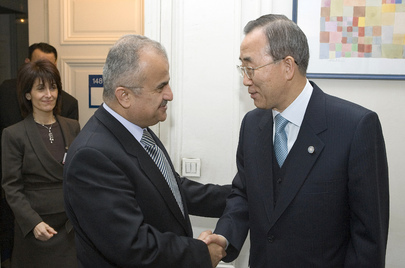 When Ban unveiled Al-Khatib as his envoy, Ban did not mention or take questions on Al-Khatib's outside business, but did say that “he is now serving as a senator of Jordan.” That set off red flags, as the UN charter says that anyone working for the UN should not appear to be affiliated with a government. That governments push their citizens with Ban and previous Secretaries General to get UN posts is one thing. But to be concurrently “serving as a senator in Jordan,” which is being protests, and be ostensibly representing the UN in Libya? Ban was turned down by Lakhdar Brahimi and Kemal Dervis, neither of whom work for and receive pay from a government, before Ban settled on Al-Khatib. Under Ban the UN has become a lawless place of opaque conflicts of interest, where topics on these questions are not answered, are even retaliated against. Watch this site. Inner City Press: Can I ask you, on Mr. Khatib, I just… I saw yesterday a clip in which they said he has a spokesman, Bahaa el-Kousy. Is it… is there a UN spokesman, UN staff member assigned to be his spokesman on this trip? Did he bring somebody in from… that he knows, do you know who this individual is? Spokesperson Martin Nesirky: I believe this is someone from within the UN system. I can let you know. But this was simply to help to coordinate the Special Envoy’s media work while in the region. Inner City Press: And is he a USG [Under Secretary General]? What is his position and compensation for this role? Spokesperson Nesirky: Special Envoy; I’d need to check precisely what the rank is. But Ban's spokesman's office has yet to provide any answers on Al-Khatib's post or pay or vetting. Without any answer from Ban's spokesperson's office, it's been learned that Bahaa Elkoussy is "UNIC Beirut Director" - we'll have more about UN system in Beirut soon.